Well, this is fun. 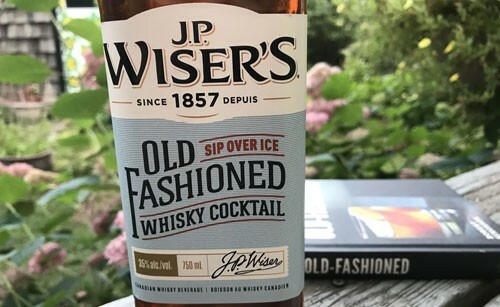 Just in time for cottage season 2018, JP Wiser’s has bottled a pre-mixed Old-Fashioned Canadian whisky cocktail. The ingredients, of course, vary considerably from bartender to bartender, but the Old-Fashioned is that quintessential cocktail blend of whisky, bitters, sugar and water garnished (or not) with a lemon twist or a piece of orange peel . Although it is normally thought of as a bourbon-based drink, Robert Simonson’s 2014 book The Old-Fashioned includes a recipe for Harry Craddock’s Savoy Old-Fashioned, made with Canadian whisky. It was simple for sure: 1 lump sugar, 2 dashes Angostura bitters, 1 glass rye or Canadian whisky. Crush sugar and bitters together, add lump of ice, decorate with twist of lemon peel and slice of orange using medium size glass, and stir well. Wiser’s Old-Fashioned varies slightly on this recipe. It contains Canadian whisky, water, sugar, orange essence and natural flavour. Most recipes recommend about an ounce and a half of whisky. Wiser’s Old-Fashioned is bottled at 35% abv, so you can expect to serve about 15 cocktails from a standard 750 ml bottle. If you are taking it to the dock, we suggest you bring friends.